Oculoplasty is a specialized branch of Ophthalmology, which focuses on abnormalities of the structures around the eye .Oculoplastic procedures refer to a large variety of surgical procedures that deal with the orbit (eye socket), eyelids, tear ducts, extra ocular structures, other structures around the eye and the face. 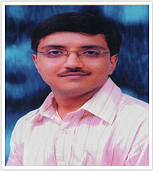 Dr harsh shah has done long term fellowship in oculoplasty after completing MS(OPHTHAL). He has done fellowship from American academy of aesthetic medicine for botox and fillers.He is only surgeon doing exclusive oculoplasty work at ahmedabad. He has expertise in all kind of oculoplastic surgeries , botox and fillers. Navkar hospital is the first and only eye Hospital In Ahmedabad - Navkar hospital is leading is one of the best eye surgery hospitals in Ahmedabad. Dr. Harsh shah has best eye specialist in Gujarat. Navkar Hospital Provides Ophthalmologist, Ophthalmologist Surgery, Orbit Treatment, Artificial Eye Surgery, And Prosthetic Eye In Ahmedabad.eye centre in ahmedabad for prosthetic eye.